Tailgating ranks high on the list of most-common driving pet peeves. There are few safe drivers who haven’t experienced another driver following so close you swear you could reach out and touch the other vehicle’s bumper, even from the front seat! In some cases, the driver compounds the annoyance by flashing their lights, honking their horn, or making rude gestures. Our San Jose car accident lawyer knows that tailgating is not only annoying, it is also incredibly dangerous. 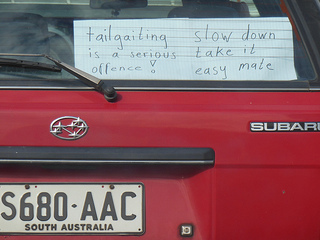 Today’s post looks to remind readers of this danger and also to provide tips on coping with a tailgater. As always, our team is ready to represent the victims of tailgating accidents, helping injured and grieving Californians recover money damages from those at-fault. In a Pleasanton courtroom, prosecutors are presenting a story emphasizing the grave dangers associated with tailgating. As detailed in The Oakland Tribune, the incident at issue occurred on June 9 on a rural road located by Pleasant Ridge Regional Park. According to prosecutors, nineteen year-old Cody Hall was driving a Dodge Neon when he began tailgating a bicycle rider and attempted an unsafe pass on the curvy roadway. Hall then lost control of his vehicle and hit 58 year-old Diana Hersevoort, killing the Dublin cyclist. Hersevoort’s husband was also injured by the Neon. Initially, Hall was placed under arrest on charges of vehicular manslaughter and felony reckless driving. The charges changed, however, when investigators found tweets in which the teen boasted about his fast and reckless driving habits. Prosecutors also uncovered a history of tailgating, including a previous accident. The charge was increased to murder. At a preliminary hearing last week, one witness testified that Hall had previously tailgated her when she was taking her children to a swim practice. She said that his driving scared her, noting that Hall eventually crossed a double-yellow line and made an illegal pass in front of her. Hall is in custody at Santa Rita Jail and the hearing is set to continue next week. California Vehicle Code 21703 provides: “The driver of a motor vehicle shall not follow another vehicle more closely than is reasonable and prudent, having due regard for the speed of such vehicle and the traffic upon, and the condition of, the roadway.” The AAA Foundation for Traffic Safety considers tailgating a form of aggressive driving and notes that aggressive behaviors play a role in up to 56% of all deadly traffic crashes. The Foundation recommends drivers follow the “two second rule,” meaning that the gap between you and the car in front of you should be enough so that you pass a fixed point at least two seconds after the driver in front of you passes the same mark. Wikihow provides an illustrated guide to responding to tailgaters, noting that avoidance is always preferable even if the other driver would likely be deemed at fault should a crash occur. While not a typical traffic safety site, the basic advice is generally sound and centers on two basic concepts: 1) Remain calm, avoiding the temptation to “teach them a lesson” or irritate the other driver in response and 2) If possible, pull over (or move to a slow, right-hand lane) in order to allow the driver to pass you. If a tailgating driver caused an accident on a Northern California road leaving you injured or claiming the life of a close relative, you have legal rights. Call our experienced tailgating accident lawyer in San Jose, Santa Rosa, Oakland, or San Francisco to schedule a free initial consultation and discuss your right to money damages.